The Secret Five Tibetan Exercises Revealed: Raise Your Energy, Tone Your Muscles, Rejuvenate Your Body & Drop the Extra Weight in Just 15 min/Day! In your 20’s or 80’s, fit or out of shape, the practice of the Five Tibetan exercises (or 5 Tibetan Rites) helps you increase your strength and flexibility, lose fat, tone your body, get a renewed vigor and youthfulness – all these and more in only 10-15 minutes a day. 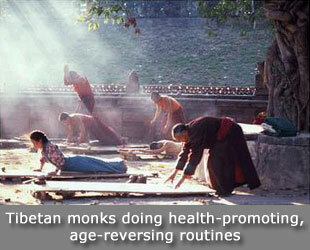 Why “secret” five Tibetan rites? …until Peter Kelder published “The Eye of Revelation” in 1939 (later re-published as “Ancient Secrets of The Fountain of Youth”). If you are even mildly familiar with yoga and weight loss you know that specific routines are extremely effective not only in helping you burn body fat, but in balancing your whole endocrine system, right? And once your hormonal system functions optimally, your health is restored. But even if you’ve never practiced yoga, you can easily learn the Five Tibetan Rites – the best kept secret in the yoga world. 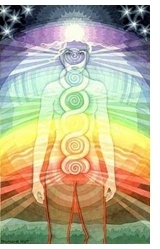 Will the five Tibetan Rites work for you too? And how is it possible to have such an astonishing impact on your health? Well, first, if you’re prepared to commit to an on-going practice, you’ll be amazed with the results. Second, the Five Tibetan Exercises are so effective because they’re specially designed to normalize the spinning speed of the body’s seven major energy centers (chakras, or psychic vortexes – pictured in the image at the right). When these vibrational centers are out of balance, we experience a chronic lack of energy, ill health, premature aging, an impaired endocrine system, sluggish metabolism and – obviously – weight gain. But doing the Five Tibetan Rites regularly activates the chakras, dissolving any blocks and getting the chi energy (life energy) flowing again normally throughout every cell in your body. As a result, your body gets rejuvenated and resumes the process of self-healing, correcting any hormonal imbalances acquired over the years due to pregnancy, dieting, a sedentary lifestyle, stress, medications, aging. In fact, with regular practice, this quick workout raises your energy and re-sets your weight set-point to the lower value it had in the past, allowing your body to release the extra weight you now carry around. That’s why the Five Tibetan Rites is one of the most effective workout routine I recommend for losing weight with hypothyroidism. Another important aspect of the body-mind-spirit healing effect of the Five Tibetan Rites is the focus on a specific way of breathing in between and during the exercises, coordinating the in and out breaths with certain movements.